Shanghai is a slick modern city with millennia of rich Chinese cultural history to draw on. Travellers can float along the Huangpu River on a scenic boat cruise, get lost in the maze-like Yu Garden, or have a drink in a traditional tea house. Shanghai is a great place to start a trip to China, as the blend of western and eastern culture makes for a pleasant combination between the familiar and the exotic. No vacation in Shanghai is complete without a stroll along the Bund. The waterfront embankment affords visitors a great view of the city's most spectacular buildings by night and day, and while it is generally crowded with tourists and vendors during the daytime, the mornings and evenings offer great opportunities for photography. 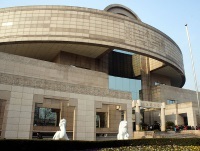 Shanghai has a number of museums worth a visit, including the Shanghai Museum - which houses about 120,000 historical artefacts - and the Bund History Museum. Travellers can also see many beautiful temples and pagodas, like the Jade Buddha Temple, Longhua Temple and the magnificent Jinshan Donglin Temple. Jinshan City Beach is a nice break from the city on sunny days. There are plenty of opportunities for water sports and other activities, including boating, bungee jumping and other fun activities. The beach also hosts annual international volleyball and kite-flying competitions.